More medieval books survive from the Middle Ages than any other artistic medium. Scholars refer to the hand-made books of the Middle Ages as manuscripts. Books that contain artistic decoration are called illuminated manuscripts. Manuscripts that survive from the European Middle Ages are generally religious books that reflect the canon, doctrine and practices of Christianity, though there are Jewish and Muslim books and other types of books that survive from this time period as well. A medieval manuscript is a codex (pl. codices), meaning a book made of pages bound between two boards. Ancient scribes wrote on scrolls that were stored in boxes. These ancient scrolls only survive in occasional fragments, as a scroll is especially vulnerable to physical degradation. The pages of codices, on the other hand, are protected by their covers and have a much greater chance for survival. Thus, medieval books survive in large numbers. The Bibliothèque nationale de France in Paris and the British Library in London house the world’s largest collections of medieval manuscripts. Though normally only available to scholars, many museums and libraries put some of their manuscript treasures on display. Digitizing, or creating high quality digital images of manuscripts, is increasingly common and these images are normally available on the Internet, furthering the study of these medieval books. The original manuscripts of the Bible, the works of Aristotle and Plato and other ancient writers do not survive. 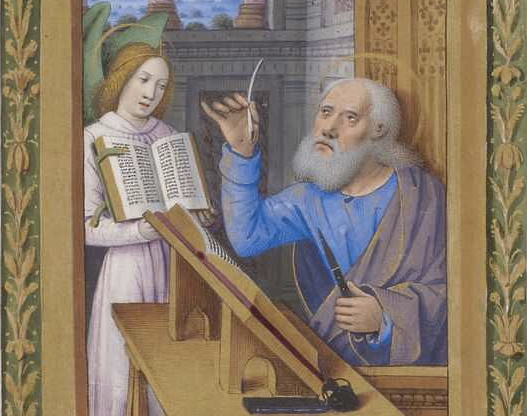 They are known today because medieval scribes diligently copied them. Recording and disseminating information is quick and easy today, but in the Middle Ages this process was slow and laborious. Monastery libraries housed most books and all books were copied by hand, usually by monks. This process of copying and disseminating books was essential to the preservation of knowledge. Some monks traveled to distant monasteries to view and copy books to bring back to their own monastery’s library. Fires destroyed many medieval libraries and the books they housed. Because of this and other accidents of history, not all texts survived the Middle Ages. The Name of the Rose, a novel by Umberto Eco, imagines such a fate for Aristotle’s lost work on poetics. Books were essential to the practice of Christianity. Medieval Christian missionaries, such as St. Augustine of Canterbury, brought books with them as they traveled from place to place preaching and establishing new churches. 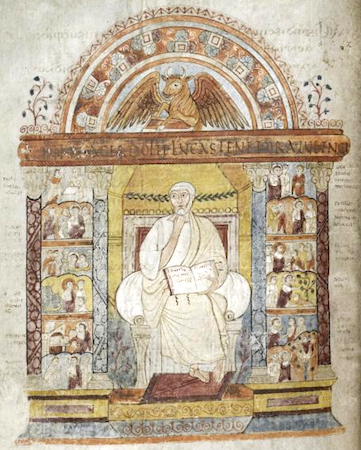 The Gospel Book of St. Augustine survives today in the Parker Library of Corpus Christi College, Cambridge. It contains the text of the gospels—Matthew, Mark, Luke and John of the New Testament—an essential work for teaching potential converts about the life of Christ. A series of images illustrating the life of Christ prefaces the text and each book of the gospels begins with an illustration detailing the events unique to that gospel, though some of these are now lost. The oldest illuminated manuscripts are among the oldest manuscripts in existence. The illustration of books was functional as well as decorative. Illuminated initials and painted miniatures marked the beginnings of important sections in the text and allowed readers to navigate the book. Prefatory image cycles prepared the mind of the reader to engage with the text. Some illustrations elaborate doctrines, record events or simply tells stories. Even readers’ doodles are intriguing to contemporary scholars. In illuminated manuscripts, words and images worked together to inform the medieval reader and occasionally these readers left their own mark. These books are highly interactive. Nearly all medieval manuscripts provide ample space in the margins for readers’ notes and comments. In this way, illuminated manuscripts are different from other types of media in that they provided spaces for readers to record their reactions to image and text. Cite this page as: Dr. Nancy Ross, "Medieval manuscripts, an introduction," in Smarthistory, August 8, 2015, accessed April 21, 2019, https://smarthistory.org/medieval-manuscripts/.